Summer is quickly drawing to a close, kids are heading back to school, fall sweaters are starting to creep into stores and late summer produce is at it's peak! Sweet peaches, juicy blackberries and tart strawberries are slowly simmered with orange zest and a cinnamon stick. The result is a delightful sweet and tart bowl of warm goodness that is open to any possibility! I put it on plain Greek yogurt for a light dessert or on my morning oatmeal for a bright pop of flavor. There is no limit to what you can put this compote on! Frozen yogurt, toast, or put some crumbled granola on top for a fast fruit crumble. Place all ingredients except mint in a small saucepan and simmer on low heat for 12 minutes. Remove the cinnamon stick and allow compote to cool for 5 minutes. 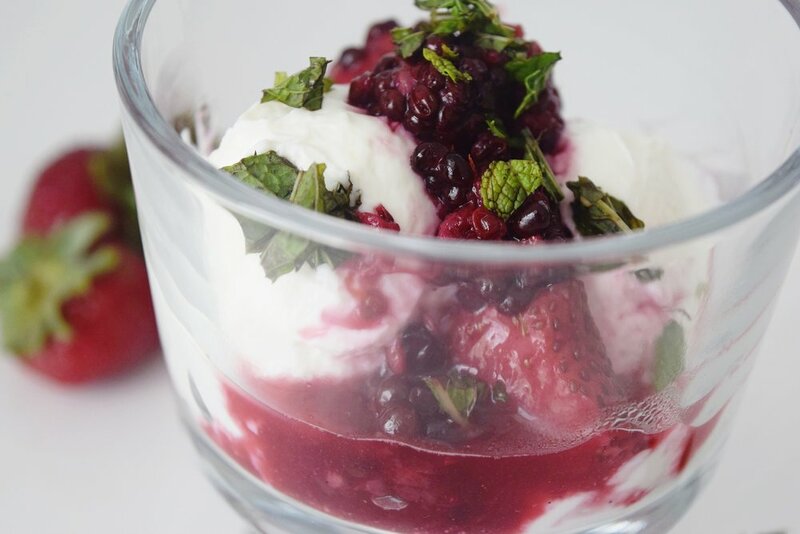 Serve over Greek yogurt with a sprinkle of fresh mint.